Get the latest news and offers from CleanChoice Energy. You've successfully signed up to receive e-mail updates. More and more American cities are committing to being more sustainable. They’re developing strategies and plans that will enable the cities to “go green.” That means using energy more efficiently, building with sustainable materials, and adopting renewable energy to power municipal operations and possibly even entire communities. But, these changes don’t happen overnight. In most cases, such extensive efforts require that the city making this commitment must transform itself. How does a city transition to becoming a more sustainable one? Let’s take a look at one American city going through the process now, Ithaca, New York. Nestled in the scenic Finger Lakes region of New York state, the small city of Ithaca is working on its sustainable future. Ithaca is repeatedly ranked as one of America’s safest, healthiest, most affordable, and greenest cities. And, in 2012, it was one of the first US cities to pledge to power its city operations exclusively through renewable energy. One of Ithaca’s initiatives is working to reduce greenhouse gas emissions within operations and community-wide. Part of the New York State Department of Environmental Conservation’s “Climate Smart Communities Initiative,” Ithaca aims to reduce carbon dioxide emissions by 30 percent by 2020 and by 80 percent by 2050. Ithaca is also a part of the Go 100 effort of the Renewable 100 Policy Institute, which pledges to move to 100 percent renewable energy. In its initial efforts, Ithaca purchased carbon offsets, and is laying the foundation to bring solar energy to the city. Aware of the resources it takes to run and maintain its public buildings, Ithaca is also improving the efficiency and carbon consumption of its public works, as well as instituting a new green building code which will help new buildings be sustainable. Eventually, all new buildings will be carbon neutral by 2040. Besides its gorges, Ithaca is most famous for being the home of Cornell University, the western-most Ivy League school. Cornell has a rich history in climate change science, being one of the early schools to study human-caused climate change and its effects. Cornell graduates often go on to work in fields of research, science, sustainability, and renewable energy resources. 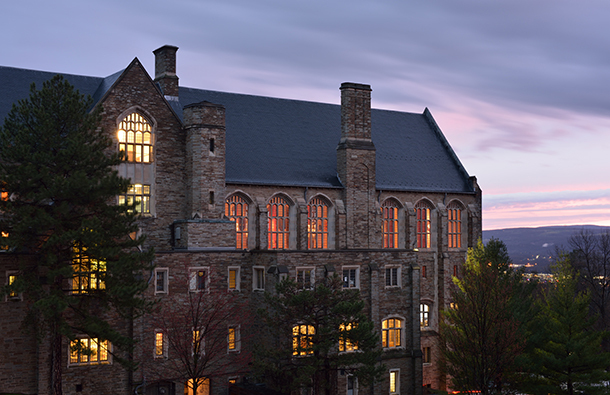 They also work to make sure that Cornell itself is as sustainable and responsible as possible. Solar energy provides ten percent of the school’s electricity needs. The entire campus is a living laboratory, working to make renewable energy solutions more efficient, affordable, accessible, and successful. Cornell isn’t the only Ithacan school working on sustainability. Last month, nearby Ithaca College committed to getting 100 percent of its power from wind energy. These examples of Ithaca’s transformation to a city that is sustainable in all senses of the word demonstrate the scale and complexity that is required. It’s also truly inspiring. We applaud the City of Ithaca, New York and other cities that have pledged to go renewable and are making it happen. You can reduce your carbon footprint now by choosing renewable energy as a customer of CleanChoice Energy. Learn how to switch your home or business to 100% pollution-free clean energy today! Sign up to get the latest news and offers from CleanChoice Energy. Zip Zip code, if provided, must be valid. Switch to Clean Energy Today. © 2019 CleanChoice Energy, Inc. The CleanChoice Energy logo, Clean Energy Option, are registered or common law trademarks of CleanChoice Energy, Inc.. All other trademarks or logos are the property of their respective holders and used under license or permission. Please select your utility provider from the list below. Based on your address, we'll be able to tell you who provides your utility service.